Over at Elite Blog Academy, we often hear a lot of questions surrounding money, like, how can I be successful at blogging? What can I expect to bring in each month? Can I make enough money to make this my full-time job? And, as much as we wished we had a crystal ball to answer all of your questions, we do have some concrete data that we hope will give you a good idea of what other blogger’s out that are making. 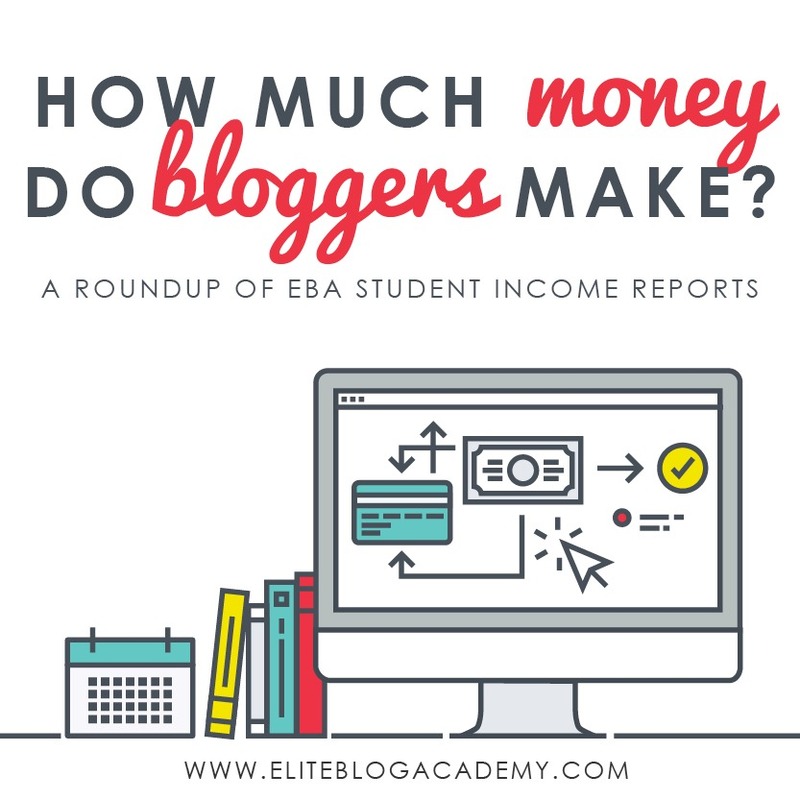 We’ve rounded up a group of blogger’s to share their latest income reports. These income reports can be incredibly motivating and encouraging, as well as a fantastic source of instruction. P.S. Are you on the waiting list for Elite Blog Academy? The doors to EBA only open to the public once a year, so be sure to sign up HERE to be notified when registration begins! To help you prepare, we’ll send you our Blog Structure Blueprint, which is an amazing tool for organizing your blog’s focus, and a great place to start! Kristin joined Elite Blog Academy in 2015 and blogs over at Believe in a Budget. In Quarter 1 of this year her blog made over $96,000, which is more than a 150% increase from last year. In her income report, she details what she is doing in her business to increase her income each quarter. You can find her www.believeinabudget.com. To view her latest income report, click here. Michelle is a blogger at Making Sense of Cents and has been a part of the Elite Blog Academy community since 2014. Her main goal in sharing her monthly income reports and to show others that it really is possible to show others the many ways you can make money online and that it can truly change your life. You can find her at www.makingsenseofcents.com. You can find her latest income report here. Jennifer joined EBA in February 2017 and blogs over at JenniferMaker.com. She is one of our amazing success stories growing her blog very quickly in just a year! She is currently sharing her income reports with her email subscribers, you can read more about how she earns her income here. He started The Ways to Wealth in late 2016 after being inspired by Pat Flynn’s income reports. I’m grateful for the encouragement and information Pat’s detailed reports provided. After starting the blog, he then discovered and read through the entire archives of income reports from the likes of Michelle Schroeder-Gardner and Rosemarie Groner. These reports helped as he worked his way through those first few months of blogging with little to show for it. Eventually the strategies he was learning from income reports started to work. Less than two years later, The Ways to Wealth has grown to over 300,000 monthly readers. He’s also left his job in financial services to work on it full-time. As the idea and inspiration for his blog came from income reports, he’s committed to writing them to help others accomplish their goals. You can see his latest here. Karissa started her blog in 2012 and after a few years of it being a hobby she discovered she really enjoyed blogging and wanted to see if she could make money from it. So she invested in EBA in 2016 and is now seeing growth in her blog and income as time goes by. She’s excited for the future of her blog. You can see her latest income report here. Ashley is the founder of Millennialist Mom and joined Elite Blog Academy in 2018. Her main goal is to help women have it all with flexible work that leaves time to be mom. A frugal lifestyle and various side hustles have afforded her the freedom to leave the 9-5 grind and work at home. Her “blogress reports” track income earned and progress seen on her blogging side hustle, and hopefully inspire others to seek flexible work. Cassie joined Elite Blog Academy in 2016 and blogs over at Life On Waller. She wants her readers to know that it is possible to make an income blogging, but gently remind them that income does not come over night. She graciously shares with her readers what is and is not working for her blog and what is earning her money on her blog each month. You can review her latest income report here. I keep seeing your offer to get a pdf about beginner blogging – but every time I try it, it does not work. I get a dead page error screen.